High quality is a must for any element in your establishment. After all, don’t you want to keep the items in your warehouse or other establishment safe from outside forces? 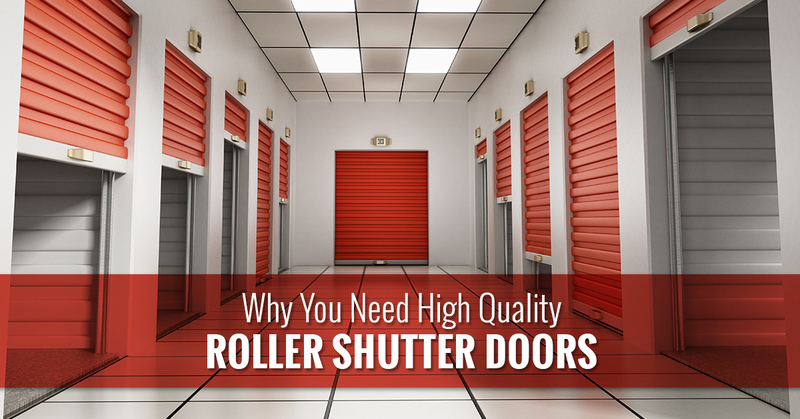 While you might think that it’s better to go with a cheaper option because it’s just a roller shutter door, we have some reasons why you need a high quality one. At United Steel Products, we only offer high quality models for our roller shutter doors. We pride ourselves on being a one-stop-shop because we can come to your establishment and fix your roller shutter door at any time of the day. In addition, we offer preventive maintenance, so you don’t have to worry about a roller shutter door breaking or paying a lot more money because we’ll check to make sure your equipment is working properly. From roller shutter door models to the accessories that you need for them, we have it covered when you choose United Steep Products. So you’re thinking about purchasing a new roller shutter door, but you’re not sure if it’s really worth the money to go with a high quality one. While it might be more tempting to go with a more inexpensive option, the old saying, ‘you get what you pay for’ is very relevant when you’re purchasing a roller shutter door. The design capabilities of roller shutter doors alone are enough to ensure that when you spend a little more money, you’ll get what you pay for. In addition, by spending a little more, you’ll protect your facility from numerous situations. If you’re still not convinced about spending more on a high quality roller shutter door, then check out some of these reasons below. Living in New York City, you’re probably aware that you need optimal protection when it comes to your establishment. Break ins occur, so it’s vital that you take the time to invest in security measures that will keep thieves outside. When it comes to protecting your establishment, our roller shutter doors will do just that. Due to the high quality of them, you won’t have to worry about any break ins. Protection and security can be one of the most important factors to consider when you have your own establishment. If you want to keep your products or your facility safe, then you’ll need to make some investments in high quality security. Repairs can be so costly when you have an item that continues to break. While high quality roller shutter doors can need repairs if you don’t take proper care of them, ones that are lower quality break much more often. Consider items that you buy that are cheaper such as shoes, clothing, or even food. The longevity isn’t there. The food isn’t as good because it doesn’t have the nutrition that you need. When it comes to roller shutter doors, purchasing higher quality as well as investing in our preventive maintenance program can be beneficial for the cost you can avoid spending on repairs. Speaking of cost, spending more on higher quality roller shutter doors can be worth it. In the long run, it’s less expensive than purchasing a lower quality option. While you do spend more initially, you also don’t have to worry about spending money on repairs or purchasing another one sooner than you’d have to because it’s unsalvageable. If you spend the time to look for a high quality roller shutter door and it lasts for 10 or more years because you took care of it, then you’re only spending money on the preventative maintenance as well as the upfront cost. If you go with a lower quality option, then you could have a door that only lasts a few years forcing you to have to purchase another one before you really had to. Are you ready to check out some of our high quality roller shutter doors? We have rolling doors, rolling grilles, rolling fire doors, shutters, side folding grilles, overhead garage doors, and high speed doors. When you come to United Steel Products, each of the models we offer is high quality. For more information, contact us.